Tracking and managing time off within your organization should no longer be a pain. Use Timeero to manage all of your time off requests within your organization and save yourself the pain of managing it the old way. Let's walk through how to setup time off within your organization (Note: Only administrators can setup time off tracking). Every time off tracked belongs to a category so let's first create a time off category. A time off category could be 'vacation', 'sick day off', 'jury duty', 'holiday' etc. Go to the left menu and visit Time Off > Add Time Off Category. 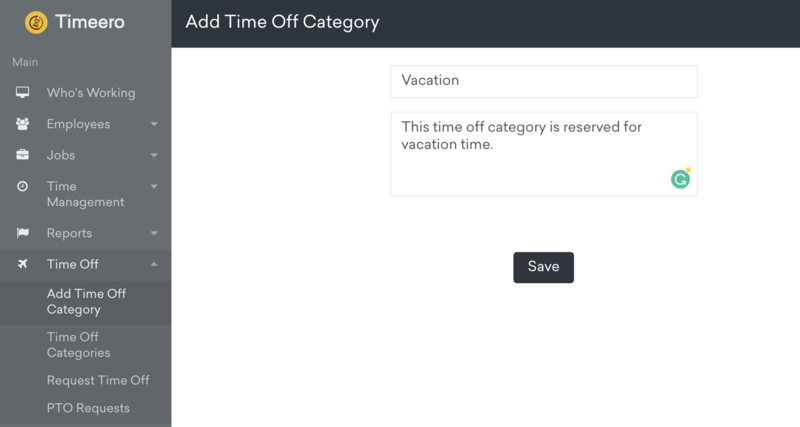 Once you've entered and saved a time off category, it will be available to all users within your organization. Once a user requests for time off, the administrator of the account will get an email to approve or reject the time off request or it can be approved via the Timeero dashboard.